Our staff have all made music a lifelong journey. With our many years of experience, we can help lead you on a journey of your own. We are not afraid to put in the time it takes to help you achieve your goals in music. Learning an instrument can have its ups and downs, but we will be there for you the entire way. The instructors at HMI know how to teach to a variety of learning styles. Whether you can read elaborate sheet music or you have never played an instrument before, we employ different teaching methods to help you grow as a musician. After spending decades touring, recording, composing, and producing music, our founder, Ivan Hampden, set out on an new adventure in 2014 by establishing Hamptown Music Institute in Clayton, North Carolina. Ivan is a four-time Grammy winner who has also taught music at local colleges and universities for over a decade. He, along with our dedicated instructors, are a true instructional dream team. The school’s mission is to prepare the next generation of musicians, artists, and music creators and help them succeed on their musical journey! Get to know our team of career professionals who all have years of experience as music educators. Founder and CEO. 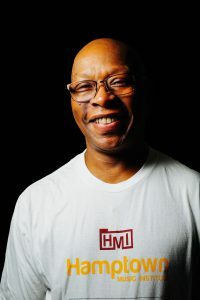 Ivan is an accomplished drummer, producer, and songwriter who has collaborated with many prominent artists such as Luther Vandross, Nick Ashford, Chaka Khan, Eartha Kitt, and others. He has been recognized on four Grammy awards for his work as a musician, arranger, and programmer on Vandross' multiple platinum recordings. Denarius was born in New Orleans and has toured the world as a musician and sound engineer. Denarius is an incredible jazz, blues and hip hop guitarist and pianist, but loves all genres of music. Currently, he heads up the music department at CSCA's Clayton Music and Visual Arts Center, and teaches at both the Cary and Clayton Studios. Cedric's passion for percussion began in high school where he became the primary timpanist and drumline captain for West Johnston HS. After high school, Cedric has continued his pursuit through teaching at Clayton High School and performing with Platinum Drum and Bugle Corp for DCI. He also channels his talents in his local church community and with various bands throughout the greater Triangle area. An avid musician, Tucker has been playing piano since the age of eight. During high school, he became fascinated with the aggressive sound of dubstep, fueling his passion for sound design. Vaeth took his passions a step further by starting his degree at Western Carolina University with a concentration in Commercial and Electronic Music. He completed his degree in 2017 and is now channeling his talents by educating at HMI. For general inquiries, fill out this form, give us a call, or reach out on social media. To sign up for a course, visit the registration page.